Do you wake up dreaming of your next travel destination? Is your inner discoverer gnawing away at you, desperate to know where this year will take you? Make 2017 the year you finally cross South America off that bucket list. 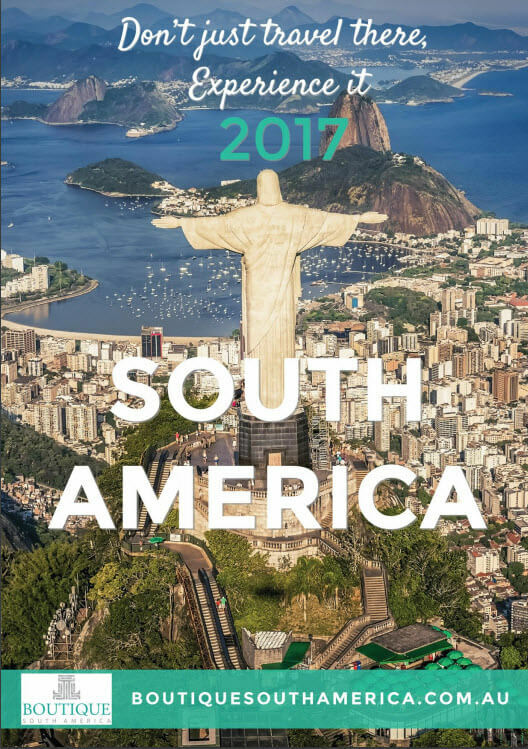 Get your 2017 South America Travel Brochure from Boutique South America Now! An exciting new travel destination, Colombia! Filled with great visuals, summaries of our diverse range of tour packages, country maps as well as the ins and outs of how Boutique South America can make your experience truly memorable. This 32 page Travel Brochure is also interactive making it a must for savvy, modern explorers looking for the ultimate South American adventure. How is it interactive? As an E-Brochure, you can not just look through the tours, you can click on different parts to bring up even more information. From the heights of Machu Picchu, the high altitude regions of La Paz, to the magnificent water feature that is Iguazu Falls and the depths of southern Patagonia. The South America Travel Brochure features tours of the most distinctive and wanderlust worthy places you will find in Argentina, Brazil, Bolivia, Peru, Chile & Ecuador. You can download your digital copy FREE today. Please note that this E Brochure is a large file (more than 10 MB) so it is best downloaded on desktop to avoid excess data charges etc.